The daily life of a falcon at heart. Grab the patch here, extract it to a local drive, then drag your v4.6 ISO onto the patch EXE. It’ll walk you through the process, and create a new optimized ISO ready for burning. 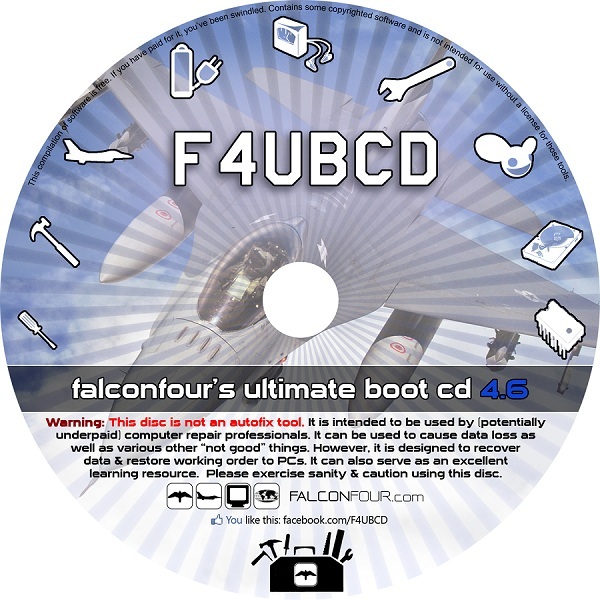 Requires FalconFour’s Ultimate Boot CD v4.6 as a source for the distribution ISO. You can’t use v4.5. Hola amigos. I don’t speak Spanish, but, you know, trying to stay hip. Like actually releasing a new version, that sounds like an awesome idea, doesn’t it? Hell, v4.5 had so many holes that’ve been fixed in v4.6, it made 4.5 look like Swiss cheese. And I’m sure the Swiss have even used this thing. It’s been all the way around the internet and back – in fact, v4.6 was created on a laptop I bought from a guy on eBay (just shopping around) that uses my disc as well! I was amazed. This thing has seen some mileage. In this boot CD are the most popular and useful tools anyone would ever need. The best of the free software, the best of the commercial software, and it all fits on one CD-R that’s readable by any computer worth booting on. Not everything can read a DVD, and USB booting is hit and miss at best. Meanwhile, since the last release in 2011, more has changed. I wrote off the dry, stale corporate IT world of wastefulness and over-powered, under-utilized systems and unnecessary, poorly planned “cloud” services. Currently unemployed (at least, as of this release! ), I found some time to put some major polish on MiniXP and get everything working well. Still would love to work in computer repair. Anyone? I’ll even move. Anything? Anyone? Bueller? Bueller? This disc, an even more minor single-point revision, is actually a huge MiniXP update. Other tools have been updated, like Memtest86+, which has been replaced with the more frequently updated Memtest86, with a smarter loading mechanism. Tons of updates in MiniXP. AHCI support, for one thing. Better driver support for network and wireless drivers, faster (and more reliable) startup, better error reporting/catching, better graphics, better compatibility with more tools and software, and… Flash support in the latest Portable Firefox! Yes, you can watch YouTube from MiniXP now. And access TeamViewer/LogMeIn which uses Flash. LOTS of work has been put into polishing the startup routine and compatibility. Plenty of features from v4.5: Virtual Floppy enables you to mount images from a USB stick to be used in a boot selection like MiniXP (for F6 SATA/RAID drivers) or FreeDOS (Dell option). VFD with file copy allows you to make a <1mb RAR file accessible to DR-DOS or Hiren’s DOS in a virtual floppy. Wireless drivers in MiniXP along with improved Ethernet and storage support. Mini Linux provided by RIP Linux. Bootable partition and imaging utilities provided by Acronis True Image and EASEUS Partition Manager. Improved Memtest86+ with failsafe mode to resolve startup hangs. Kon-Boot 1.1 is really v1.1 now, with support for 32-bit and 64-bit Windows. Tons of new utilities in MiniXP with new launchers to provide easier access. ERD 5.0 is integrated with MiniXP for offline system restore and service/driver management, and Microsoft DaRT 6.5 (x86 and x64) are added to support Windows Vista and 7. Antivirus scanning with real-time updates is provided by DaRT 6.5’s Standalone System Sweeper, and allows you to load definitions to a USB stick for live updating. This ain’t yo mama’s BartPE compilation. Once you dive into this disc, you’ll never need another boot CD. Based on F4UBCD v4.5 with MiniXP from Hiren’s 15.2, heavily modified. MiniXP gutted and rebuilt with new, flexible on-disc scripting, for easy mods. 4.6, Apr-1-13: Many modifications to MiniXP. AHCI/RAID support (not quite universal yet due to architecture). Firefox update with Flash support. Memtest86 instead of Memtest86+. Streamlined boot menu configuration. Made USB setup easier with BootICE. ImageX front and center on the desktop now, as well as some additional new icons. Vastly improved MiniXP startup process. PDF, Word, Excel file viewing support. Replaced a billion references to outdated portable Opera browser in MiniXP with Firefox. Much improved network driver support. Battery support. Power management support (no longer roasts laptop CPUs while in MiniXP). Added keyboard switcher in tray. More sane date/time display. Then grab the v4.61 Patch to get up to date. updated links 6/20/2017 ~~ screw you, Dropbox, leader in web resource link rot! … to name a few. If you use their software on the disc routinely, please at least have the decency to buy a license! You should, after all, only be using software you’re licensed for – I have a license for each one myself. And if you do feel like donating… thanks for your support!! THIS VERSION IS OBSOLETE. DON’T DOWNLOAD THIS VERSION. GO GET v4.61. 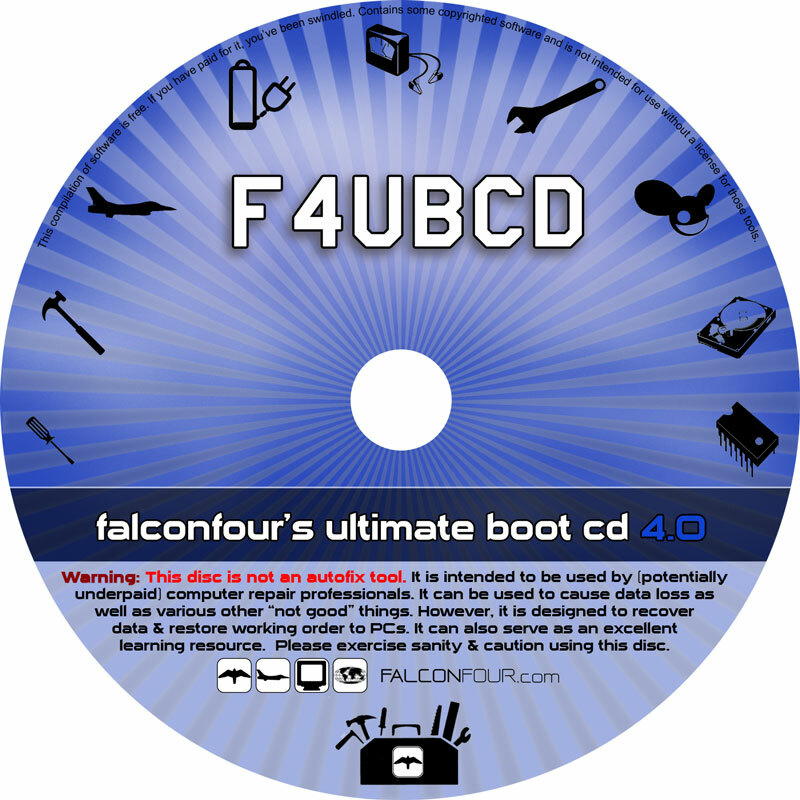 At last, for your enjoyment… the latest version of FalconFour’s Ultimate Boot CD has arrived. V4.5 may be just a 0.5 version bump, but there is so much good stuff in here, lots of changes and lots of cool new toys to play with. It’s been a long time. How have you been? Things have changed since we last met… I got myself a corporate IT job, still doing computer repair on the side. But being a side thing, kinda has its pros and cons. On one hand I don’t have constant first-hand experience using the disc anymore. On the other hand, I can also take a step back and look at it from a designer’s point of view… how well does it work? What does it do good, what’s bad, what could be done better? How can I make this the ULTIMATE BOOT CD it claims to be? This disc, a minor half-version revision, is the answer to those questions. Scoured through every option, considered the usefulness of some tools, added others, collaborated with users over Facebook, gutted some functions and built others. A launcher here, a script there, and about 1,500 WIM captures. I imagine I went through some 20 ISO re-burns, 150 virtual machine boots, 200 VHD mount/unmounts… I can’t even count how much time has been put into polishing this thing. All for the love of making computer repair accessible to anyone that wants it. Of note… let’s see here. Virtual Floppy enables you to mount images from your USB stick to be used in a boot selection like MiniXP (for F6 SATA/RAID drivers) or DR-DOS (BIOS flashing). VFD with file copy allows you to make a <1mb RAR file accessible to DR-DOS or Hiren’s DOS in a virtual floppy. Wireless drivers in MiniXP along with improved Ethernet and storage support. Mini Linux provided by RIP Linux. Bootable partition and imaging utilities provided by Acronis True Image and EASEUS Partition Manager. Improved Memtest86+ with failsafe mode to resolve startup hangs. Kon-Boot 1.1 is really v1.1 now, with support for 32-bit and 64-bit Windows. Tons of new utilities in MiniXP with new launchers to provide easier access. ERD 5.0 is integrated with MiniXP for offline system restore and service/driver management, and Microsoft DaRT 6.5 (x86 and x64) are added to support Windows Vista and 7. Antivirus scanning with real-time updates is provided by DaRT 6.5’s Standalone System Sweeper, and allows you to load definitions to a USB stick for live updating. Based on Hiren’s BootCD 13.0 Rebuild by DLC, minus some unnecessary clutter. Update: F4UBCD now has a Facebook page and a bundled discussion board – go Like it! I’ve put a good amount of work and thought into creating and refining this new version, and it’s always rewarding to see people actually using it. I’ve completely rebuilt the whole thing from scratch, starting with Hiren’s BootCD 10.6 (which this collection is built on), and building everything out around it in such a way as to allow less experienced (but still knowledgable!) users to easily add and modify the tools in the set, so that things aren’t “baked into” the disc the way the HBCD tools are – good luck modifying a UHA archive! So I set out to make the F4UBCD flexible, starting with just a tweak here, a line there, and a whole boatload of batch code. Warning: This disc is not an autofix tool. It is intended to be used by (potentially underpaid) computer repair professionals. It can be used to cause data loss as well as other “not good” things. However, it is designed to recover data & restore working order to PCs. It can also serve as an excellent learning resource. Please exercise sanity & caution using this disc. Hiren’s BootCD 10.6 minus Linux and a few others. Now playing at a friendly torrent site near you. As usual, jfgi.